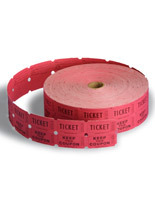 Having trouble organizing a vote at town meetings, classrooms, or at the office? 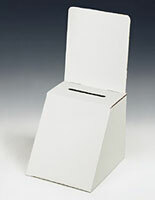 These corrugated ballot boxes are an ideal solution. 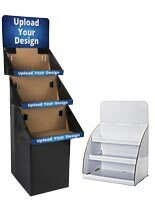 These affordable cardboard displays are available in floor standing and countertop models to work well in any situation. 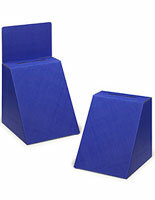 Use these stands to hold classroom elections, conduct votes at the town hall, or as a suggestion box for employees. 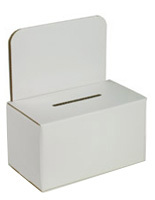 These ballot boxes are very inexpensive, allowing purchasers to buy in larger quantities if necessary. 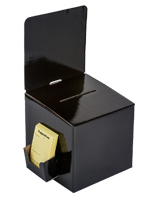 Plenty of storage space is included in these boxes, and suggestion cards are sold separately if needed. 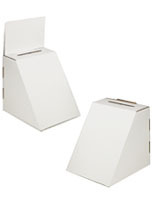 These cheap ballot boxes are available in white or black and will easily mesh with any décor. 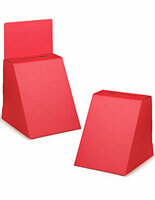 Use markers to color these displays in or decorate the sides of the boxes to give it a unique flair. 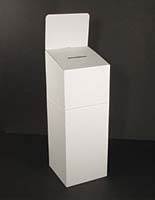 What advantages do these cardboard ballot boxes have over others? 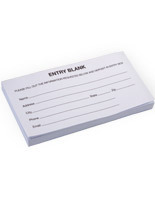 Looking to collect information of potential clients at a trade show? 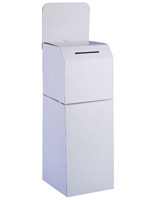 These corrugated ballot boxes are an ideal choice! 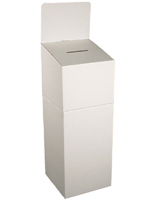 The floor standing models are an ideal height for people to insert forms at the top, and the design allows them to fold completely flat. 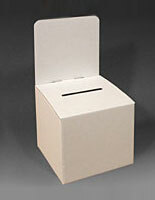 Easily transport these inexpensive ballot boxes from one venue to another, without wasting valuable vehicle storage space. With so many people visiting a trade show booth, it can be difficult to speak with everyone. 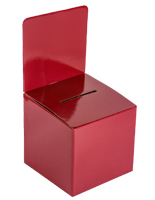 Collect information with a suggestion box to get addresses and emails to add people to a mailing list or an online newsletter. 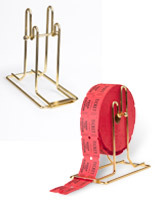 You could also use these lead boxes to collect entries to raffles and contests! 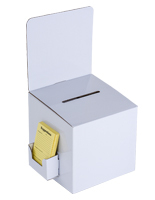 Use these corrugated cardboard ballot boxes for schools and offices as well! 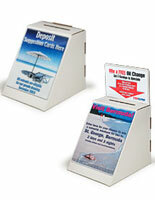 With such low price points, these inexpensive displays are a more reasonable option! 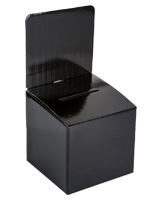 Organizing elections is easy with these boxes. 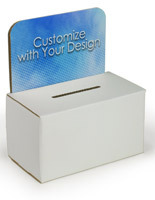 Custom label each voting box so participants know exactly what option they are choosing. 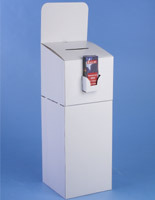 Some of these displays also feature pockets to store suggestion forms, brochures and informational pamphlets. 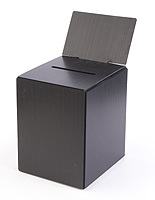 Teachers can also use these as a request or complaint box. Students can voice concerns or issues with other students that they don’t necessarily want to say aloud. Make students feel more comfortable in an environment where they know they can voice complaints if necessary. While emails are a discreet way to voice a concern in an office setting, they take away the ability to remain anonymous. A comment box is a great forum where employees can raise issues, give credit to other employees, or share general thoughts without being identified. At the end of every month, managers can than go through the box and address the entire team either through email or in a meeting, so people can have an open and honest discussion about issues in the workplace. 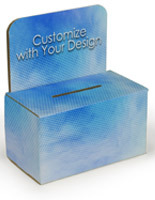 A comment box may end up helping lower stress levels and keeping the workplace in a more lighthearted mood. 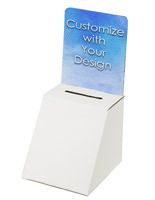 These cardboard displays are a feasible and inexpensive option to make that happen. 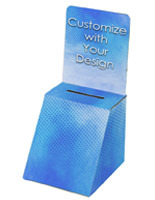 The main comment and donation box category features plenty of other options beyond these corrugated displays that are ideal for any setting. 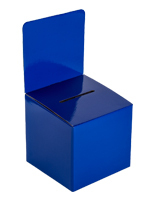 Looking to advertise for other businesses and retail stores? 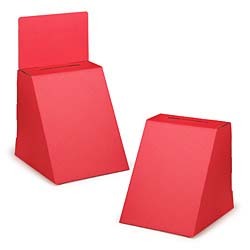 Check out some of the signage displays for poster frames, neon signage, write on marker boards and a-frame displays are available to meet any business’s needs. 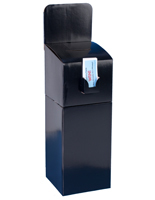 Advertising and equipment is also available for restaurants as well. Looking for something a little more personal? 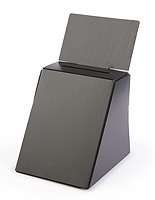 Displays2Go offers picture frames, home iPad stands, and other great accessories. The main catalog for this site currently features more than 4,000 unique SKUs. Orders can be placed either online or over the phone today. Hurry up and call now!